Civic leaders in Waterbury, CT led by Augustus Chase established the Waterbury Manufacturing Company in 1876. They manufactured pins, buttons, saddle and harness parts, upholstery trim, and other utiliarian wares mostly made out of brass. Augustus was succeeded in the company by his son Henry, who ran the company so successfully that by 1900 a needed rolling mill was built. Soon, the company's name was changed to the Chase Metal Works and became a major supplier to the U.S. government during the years of World War I. Following the war, Chase like many other manufacturers which had shifted to wartime production needed to now retool for peacetime production. Once again, the company's legal name was changed, this time to the Chase Brass & Copper Company, and Frederick Chase became the new leader of the company. He mounted an aggressive marketing campaign to introduce Chase products for the home consumer markets. In 1928, advertising manager Rodney Chase introduced the centaur mark in which a centaur holds a bow in the midst of a hunt, or chase. The Chase centaur mark appears on almost every piece made after 1928, although an impressed mark is under the rivet that attaches the bakelite handles to select pieces. 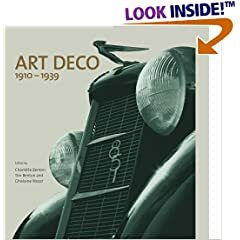 These were years of Art Deco style, and iconic buildings like the Chrysler Building and Radio City Music Hall in New York, the Union Terminal in Cincinnati, and most of Miami Beach needed lighting and accessories to go with the new Deco style. By 1936, both the Chase home and commercial businesses were booming to meet the demand of commercial and office buildings as well as homeowners who were anxious to adopt this new streamlined and geometric style. 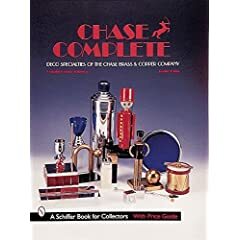 Chase quickly became one of the largest producers of high quality, machine made Art Deco lighting and accessories with finely made products such as barware, candlesticks, smoking accessories, lamps, and assorted serving pieces. Chase products were sold in special gift departments called Chase Shops in well known jewelry and department stores like Marshall Field’s in Chicago and Bloomingdales in New York. The company commissioned many of the best industrial designers of the day to develop new offerings, enlisting leading and innovative designers Russel Wright, Rockwell Kent, Walter von Nessen, Ruth Gerth, Lurelle Guild, and Charles Arcularius. Chase also had a talented iIn-house designers such as Harry Laylon, and it was widely acknowledged that their designs and manufacturing were superior to most any other competitor in the marketplace. Still, while Chase metalware was extremely well made, it was also affordable in these still difficult years following the depression when the Chase chromium finish was introduced. Chrome has an extremely high melting point and accommodates a high polish finish. Chase wares often paired the chromium finish with bakelite, catalin, and walnut handles and accessories, well suited for serving hot food and beverages. 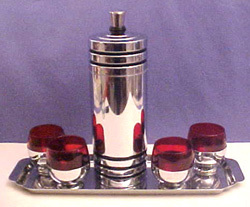 Some Chase products like cocktail sets also included glassware, typically in clear or cobalt blue colors purchased from leading glass manufacturers of the day such as Libbey. Buyers appreciated the low cost elegance of Chase barware and metalware, and it retained its gleam with virtually no polishing. 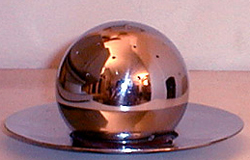 Chase chrome had a brass or copper base under the chromium plated surface. Using these non-ferrous metals as a base ensured that the chrome finish wouldn’t rust, flake, or pit. 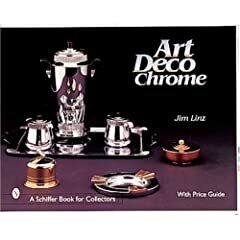 Chase metalware even attracted the attention of home economist Emily Post who endorsed Chase products in the book How to Give Buffet Suppers featuring a variety of Chase Chromium serving and heating products. Broadway and Hollywood films also made extensive use of Chase Art Deco industrial design in their sets during these exciting theatrical years. Chase metalware continued to be sold up until the onset of World War II at which point they once again converted to wartime production. After World War II, Chase chose not to resume making consumer products and the production of their most famous works ceased. Buy period Chase barware and metalware on the Art Deco & Art Nouveau and Bronze & Metalware pages, or search the entire site for great antiques, collectibles, and crafts for every collector! Sell or consign period Chase, Farberware, Roycroft, Stickley, Frankart, and more at Collectics. Read about our top performing national consignment program for estate and personal collections.